Words are powerful and have an impact. They are capable to encourage, to build and to heal or they can ruin, damage, hurt and be painful. Ultimately, words can wound the depths and core of our soul, eventually capable of affecting your mind. When the mind is affected, your self-image becomes tainted, affecting your belief system and who you are and not what Christ intends and has created you to be. When your belief about yourself is affected, then so are your actions and behaviors. Words can create or destroy relationships, friendships and the reputation of a person. It can bring unity or division, a split among friends and/or family. In Genesis 1 when God spoke His words had power. When he said "Let there be light, Let there be firmament (sky;heaven, Let the waters be gathered into one place- His words created life. It created. Words are powerful. Likewise as we are created in His image as stated in Genesis 1:26 it says: "Let us make man in Our image, according to Our likeness; let them have dominion over the fish of the sea, over the birds of the air, and over the cattle, over all the earth and over every creeping thing that creeps on the earth." We have the ability to create like Him. Through our words, we speak life or death. James 3:1-2 it warns against an "untamable tongue." During these days what kind of person do you want to be? What kind of leader? What kind of friend? What kind of spouse? What is in your heart: Matthew 5:18 But the things that come out of a person's mouth come from the heart and these defile them. Be that person, friend, spouse, leader that speaks life. Psalms 19:14 "May the words of my mouth and this meditations of my heart be pleasing in your sight, Lord, my Rock and my Redeemer. 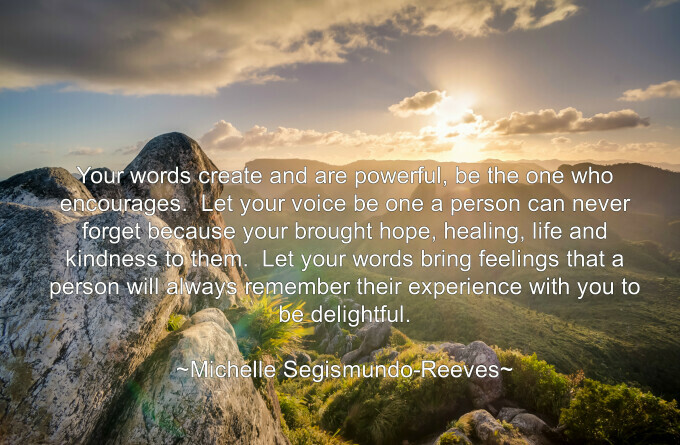 Be the one who helps bring healing by the use of your words. Proverbs 16:24 "Pleasant words are like a honey comb, Sweetness to the soul and health tho the bones. Proverbs 12:18 "There is one who speaks like the piercing of a sword, But the tongue of the wise promotes health." Your words create and are powerful, be the one who encourages. Let your voice be one a person can never forget because you brought hope, healing, life and kindness to them and because your brought unity among friendships and not division. Let your words bring feelings that a person will always remember their experience with you to be delightful. On the other note: there are many of you who have been hurt by words spoken to you or over you through the years. It may have been a gesture, look, behavior from another person which are ways of communication (called non-verbal communication in fact research shows that 70% of communication is non-verbal,) so in reality we are always communicating whether verbal or non-verbal. Whether these words were in person or through gossip, words are capable of wounding your soul that can affect your mind, words that have become voices in grained in you and because of those words you have been affected by how you see yourself and live life; The kind of words that have held power over you that have kept you from fully living. Therefore you question yourself, resulting in one of two ways. The first being limited in your thoughts of who you are in Christ, your identity in Him, your capabilities, your relationships, your personhood, your meaning and purpose. The second, you are able to maintain friendships, achieve to a certain level, however, there are areas in your life that have been limited in moving beyond because of words and/or behaviors/gestures that were communicated to you. I would say to you let those voices be no more and those words be silenced, let them not define you, who you are, your capabilities, your purpose. Let God's voice, His words of life, love , hope and healing reign in your mind. See with the eyes of God who He sees and knows you to be - Loved with a purpose. Invite God into your mind and heart; allow Him to rewrite the negative words spoken to you. Be around people who will encourage and build you up, those that encourage your dreams, and goals and are willing to speak with love into your life. Disengage from toxic relationships, such as those that discourage you. Focus on the words God says who you are. Take time to process forgiveness to be able to forgive in your own heart so that words and actions will no longer have power over your mind, heart and soul. In the same way let us be a person who speaks life into the lives of others and be a person of honor in relationships. In a world full of chaos, it appears it is only getting worse and darker for believers in Christ and many people in general are recognizing that there is overwhelmingly bad news happening all the time. Climatic/troubling events appear to be increasing and the frequency of events are closer. The lists of events keep accelerating/growing. Yet, amidst all of this God still reigns. He reigns; his thoughts are not ours, no matter what is going on. Though in ourselves we may be disappointed, dismayed, discouraged worried and fearful in this time. In Isaiah 55:8-9 says “For my thoughts are not your thoughts, neither are your ways my ways, declares the Lord. For as the heavens are higher than the earth, so are my ways higher than your ways and my thoughts than your thoughts. For this time we live in is precious, it is special. God has not called us to walk in fear, neither has he called us to being complacent or apathetic in our faith. Let me explain this a little further. Often our natural response to danger is to fight or fly, in other words fight or flight and, it is easy to fall into fear vexed with anxiety. The fight or flight response is there for your protection however, it can become your prison if you allow it to overtake your well being fearful and anxious responses or beliefs. As it says in 2 Timothy 1:7 For God gave us not a spirit of fear; but of power and love and sound mind.” Now given there may have been a history of events in our own life that developed scripts or responses to being anxious, nevertheless God can heal, and He can bring peace where no person or object can. In addressing the multiple disturbing events taking place- we are not to be in terror, as believers our security is in God Almighty even when it is difficult, we are to hold on to him, thus we are to be strong and to love boldly. We are to speak up in steadfast love. 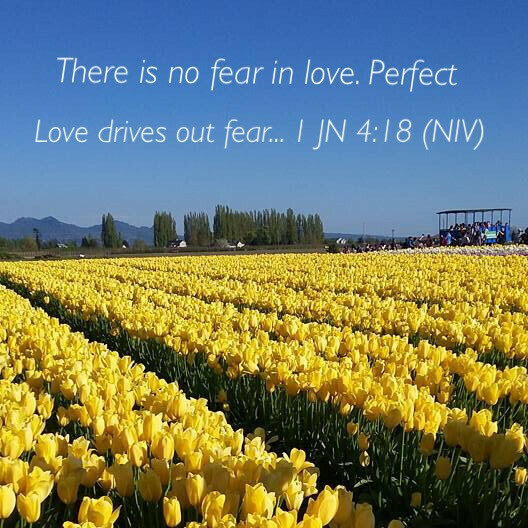 For love conquers fear. Be alert and strong during these shaking events. Let them awaken us to pray, to love and hold the hurting. So let’s love boldly and fiercely, with unconditional steadfast, immovable, unshakable, extravagant, compassionate, merciful love only God can give. A kind of love that brings seekers into a place of unconditional acceptance that produces a heart of repentance. For this love that God graciously pours out is the kind of love that has transformed many lives for His glory leading to internal peace, public joy and personal freedom and everlasting life. Everlasting life in freely given through Christ dying on the cross for our sins, by believing in our heart and confessing with our mouth that Jesus is Lord, therefore breaking the power of death over us and producing life abundantly. For this time we live in is precious, it is special and God has created you for such a time as this.